HubSpot CRM is a free online CRM platform that can help you manage your company better. Contacts and your business deals can be added to concentrate all aspects of your business on one platform. Hubspot CRM is really easy to set up and provides minimal but essential and efficient functions. It gives you a full review of all your deals, forecasts and how productive your company is at the moment. You can add unlimited number of companies and individual contacts. Deals are easily managed and unlike other free CRM platforms, are based on the stages of progress. For each deal you add separate notes and further details that help identify it better. Filters on Deals, companies and individual contacts make it easier for you to browse them. Daily tasks can be added to keep a tab on the progress one is making. The timeline for both tasks and deals will help you concentrate on the issues you are facing in your company. Let’s take a better look at this free online CRM platform. You can also check out this list of other free CRM software. 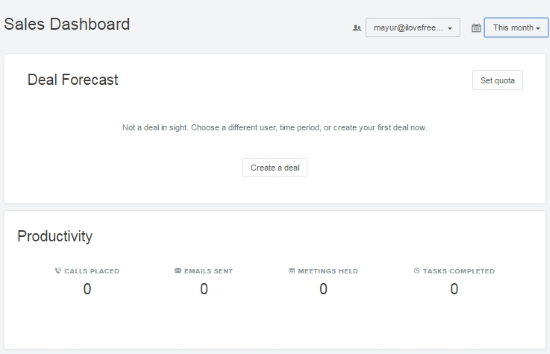 The dashboard of this free online CRM platform shows the Deal forecast, Productivity forecast and the Pipeline review. 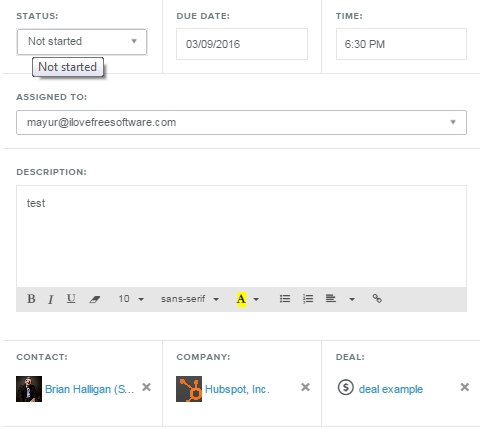 On the dashboard of Hubspot CRM, you’ll be able to set up your CRM the first time you log in. Contacts can be imported by clicking on Import your contacts. You’ll be asked to choose whether you want to add contacts of companies, individuals or deal amount values. 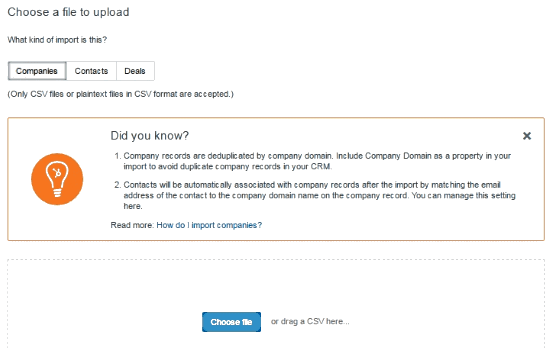 You can add them by uploading files in CSV format. 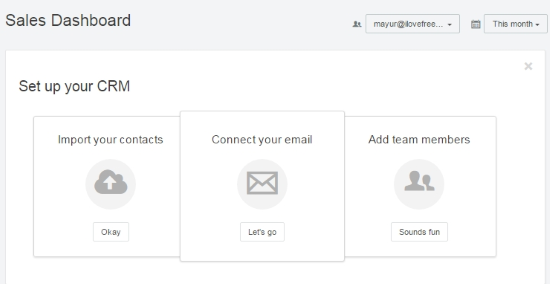 You can connect your email with the powerful email tracking Chrome extension by Hubspot, called Sidekick. Here is a full review of Sidekick that I did earlier. To download Sidekick, click on let’s go under connect your email. Then enter your Hubspot ID (provided on the Hubspot email page) on the Sidekick form and you’ll be connected instantly. Team members can also be added and managed by selecting Add team members on the dashboard of this free online CRM platform. You’ll be directed to the settings page with Users tab open. Here you can select invite and manage users to add more users to this free online CRM platform. You can filter out users based on the roles from the dropdown menu. Permissions and visibility can be changed by selecting one or more users and clicking Edit Permissions. You can do the same thing separately for different users by clicking Edit Permissions on the right of each user. A very awesome feature here is the filters you can add to select a particular type of contact. Click on Create a deal under Deal Forecasts to create a new deal. A window will ask for the new deal’s name, pipeline and the stage that the deal is in. You can leave the deal amount and date if you do not have those details yet. Only the name of the deal is important, the rest can be edited later too. You’ll be directed to the deal’s page where you can further edit it. You can set the progress stage with the green slider on the top. The important part here is that you can leave notes, schedule events, enter activity logs and also create tasks. The activities you have performed pertaining this deal will be showed on the bottom right timeline. On the left, you can add contacts of companies and individuals pertaining to the deal. You can also add important file attachments from your computer related to the deal. When you’re done, click on Save at the top. Deals can be added and managed from the Deals tab too, which you can find on the top of the page. You’ll get a nice board layout of all the stages of a deal and the deals placed in those stages accordingly. If a deal completes a stage, then you can click and drag it to its next stage or any other stage that it has achieved. You can change the layout from the table button on the top left above the board, which shows a table of all your deals. To add a contact, click on the Contacts tab at the top. On the Contacts tab, click on Add contacts and a window prompts you for the full name and email of the contact. You can assign contacts to different users by selecting the contact then clicking assign contacts on the top followed by selecting the user you want to assign it to. There are different views for the contacts added to your Hubspot CRM. These can be accessed from the panel on the left. My contacts shows you the contacts assigned to you, All contacts shows you all the CRM contacts, Call Queue shows you contacts that you’ve added to the call queue. On the Call Queue list, you can press Start calling to emulate the call you are making. The call status will be added based on how you emulate the call. You can also create Views which basically organize your contacts differently based on what you add to them. These can be exported into a XLSX file from the bottom left of the view panel. A powerful feature here is the filters you can add with various constraints. This is very helpful if you want to find a particular type of contact. You can filter out the contacts based on revenue, email, industry, IP address, day they became a lead, etc. Adding Companies is almost the same as adding individual contacts. Click on Add company on the top right, enter the company’s website domain and its name. You can do the same things you can do on the contacts like making a new view, exporting views, assigning companies to different users, adding filters, etc. But unlike contacts, you can’t add them to a call queue. This free online CRM platform makes it easy to manage your daily tasks. Click on the Tasks tab on the top menu followed by Add task on the Tasks page. You can enter the task’s description, status, due date and time. 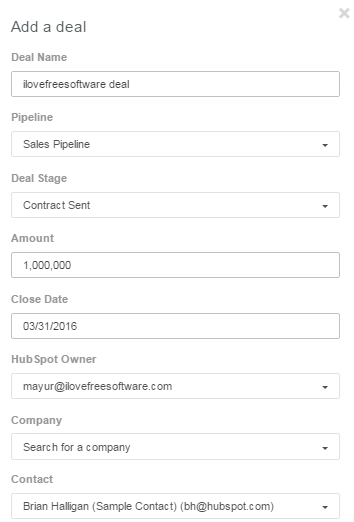 Contacts, companies and deals can also be added from the bottom options which are related to the task you are creating. 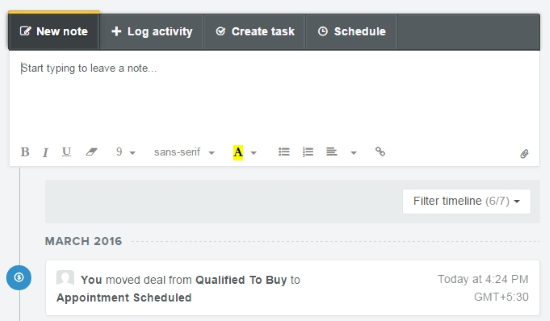 Once you’ve entered all the task details, you can drop down menu under ‘Assigned To’ so you can add the assignee. Hubspot CRM is an easy to use free customer relationship management platform. I’ve tried a few other CRM platforms like Salesforce and they seem to be complex. Though Hubspot CRM lacks on creating custom coded triggers but with its Sidekick integration, it can do a lot. So if you want a smooth CRM experience with essential but minimal features, Hubspot CRM is for you. I award this free online CRM platform with 5 stars. Know a better free CRM platform? Share it in the comments!